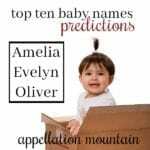 The new US baby names popularity data comes out next month, which makes it time for Trendwatch 2019 boys predictions. Every year, I try to predict 30 names likely to tip into the US Top 1000 when the data is released. This list covers the boys; the girls’ list will follow later this week. Oh, and one more detail: the Social Security Administration counts every spelling as a separate name. But for our purposes, these fifteen names don’t appear in the US Top 1000 in any spelling … yet. Except for this: that name inside the Top 1000? It will appear on the official Social Security Administration list published here, and syndicated at baby name websites all over. That means more eyeballs will see that #983 name that a name just a few spots outside the Top 1000. All of this gives names inside the Top 1000 significantly more exposure than those outside the Top 1000 – even when they’re used on almost the same number of kids. In 2017, it took 202 births for a boy name to make the US Top 1000. A handful of names given to 201 boys also made the list, but it goes in alphabetical order, and cuts off after the list reaches 1000 entries. When I first started prognosticating, I paid less attention to patterns. But after a few years, I noticed this: a name given to seven – or 23 or even 52 – boys last year will almost never gain in use dramatically enough to reach the Top 1000 the following year. 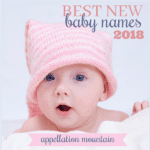 We love to click on headlines like “why everyone is naming their baby after this Game of Thrones character” – and novel names do sometimes soar – but it’s not the norm. That means my Trendwatch focuses on names given to around 150 boys or more in the last data set. You’ll also notice that plenty of these names repeat from last year. That’s because the hottest names to watch sometimes take a few years to break into the Top 1000. It’s a long shot, but I can see Arrow heading straight up. 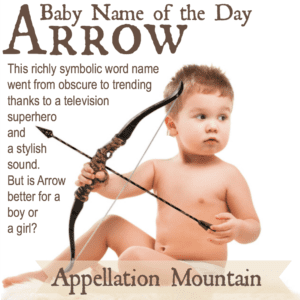 Erm … okay, it’s tough to write about a name like Arrow catching on without resorting to puns. But here’s the thing: Arrow combines a stylish sound with a meaning that hits midway between epic picks like Maverick and virtue ones like Bodhi. It’s a weapon name, but one that feels less violent than many, a superhero’s alter ego, and a romantic choice, a study in contrasts that might just go mainstream. Read more about Arrow here. We love a good occupational surname these days. Just ask Mason and Carter. That bright ‘a’ sound is popular, too. But Baker makes the Trendwatch 2019 predictions thanks to Baker Mayfield, the record-setting rookie quarterback for the Cleveland Browns. The name started to shoot right up during his college career, which culminated in winning the 2017 Heisman Trophy. And while he’s not without controversy, the combination of a winning athlete and an on-trend sound has lifted many a name. I’ve yet to write about Baker, but check back and I’ll update when I do. Fox rocketed straight past Bear, even though Bear has had buzz for far longer. Maybe parents fret that it feels too borrowed from the celebrity baby name list? Still, I think it’s only a matter of time before this nature name goes mainstream. 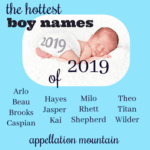 I’m guessing that at least a few of those boys named Theodore – and maybe Arthur and Barrett, too – answer to Bear as a nickname, which makes it feel more and more approachable as a formal name on a child’s birth certificate, too. Read more about Bear here. Benjamin is holding steady in the US Top Ten, a traditional name with plenty of appeal. Other Ben- names were bound to rise, too, like Bennett. Benedict gets a bump from this trend, too, but also the delightfully named leading man, Benedict Cumberbatch. He’s earned an Oscar nomination for a serious role, and brought Sherlock to modern London for the BBC, but he’s also headlined 2016’s Doctor Strange and joined the cast of the successful Marvel Avengers franchise. He’ll be back in Endgame in just a few more weeks. All of this makes Benedict seem rather dashing. Read more about Benedict here. Here’s my case for Boden: Beau, Bodhi, and Boone all climbed in 2017. Boden seems like the logical extension of the trend, a two-syllable, ends-with-n name. The British clothing company could give some parents pause. But it’s not quite like naming your kiddo Gucci or Armani. Entrepreneur Johnnie Boden’s designs are accessible, fun, and at least part of his collection is aimed at kids. I think that makes it feel upbeat and familiar for parents of young children – which could be a plus. I’ve yet to write about Boden, but check back and I’ll update when I do. Calvin, Callum, and Callan all gained in 2017. And lately we’re all about longer surname names for boys. 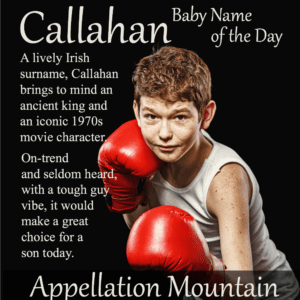 Callahan fits right in, a three-syllable name with handy short form Cal. Plus, there’s something capable, cool, and just a little edgy about Callahan. Maybe that’s because Clint Eastwood played San Francisco police detective “Dirty” Harry Callahan in the 1970s and 80s – just recent enough that today’s parents may not think of the character, but the association lingers. Read more about Callahan here. Take Evan, smoosh it with Alexander, and you’ll have Evander – which actually has eons of history as a given name, dating all the way back to the Trojan War hero. The question, then, is why hasn’t Evander caught on sooner? Maybe it took another rising pair of similar names – Everett and Oliver – to remind parents just how much they like these sounds. Read more about Evander here. Without charismatic actor Idris Elba, it’s hard to imagine parents discovering this rarity. But it’s a fascinating name, one with roots in Arabic and Welsh. There’s a prophet in the Quran by the name. In Arabic, it means interpreter. But it also claims Welsh origins, meaning enthusiastic. It’s the name of a giant in Welsh legend. Elba’s career has taken him from the streets of Baltimore in The Wire to the halls of Asgard in the Thor movies. Rumors have circulated that he’s a candidate to play James Bond, but at the moment, he’s using his real-life DJ skills in a new Netflix series. With all this visibility, no surprise Elba’s appealing, cross-culture name is catching on. I’ve yet to write about Idris, but check back and I’ll update when I do. Murphy feels friendly and accessible, an Irish surname with plenty of spirit. The successful revival of television series Murphy Brown could make this name unisex, but it’s rising for boys and girls alike right now. Murphy could follow choices like Brady and Riley into greater use. It’s probably on plenty of family trees, too, as one of the most common Irish surnames. A bonus? The great meaning: sea warrior. Read more about Murphy here. Mythological names are favorites – just look at Atlas and Orion. So are names starting with vowels and ‘s’ enders, too. And Egypt has attracted some attention from the naming community – Cairo is rising fast for boys, and Egypt recently debuted in the girls’ Top 1000. So why not Osiris? Sure, he’s the god of the underworld – but also of rebirth. I think it’s a safe bet that Osiris might be among the next group of Top 1000 debuts. Read more about Osiris here. Palmer strikes an interesting note. It’s a surname, just like Parker and Hunter and Carter. But in medieval Europe, a palmer was a pilgrim, one who had traveled to the Holy Land and returned with a palm branch. And while some surnames feel a little rough and tumble, Palmer leans more gentlemanly. Credit golf legend Arnold Palmer, perhaps, or maybe even its use in Sense and Sensibility. There’s something commanding about Ramsey. It’s probably down to that first syllable. It conjures up forcefulness, and a certain stubborn determination. Like many familiar surnames, it’s hugged the edges of the US Top 1000 before. But this time, I think it could be set to soar. There’s celebrity chef Gordon Ramsay, personal finance guru Dave Ramsey, Game of Thrones character Ramsay Bolton, and plenty of other notables. I’ve yet to write about Ramsey, but check back and I’ll update when I do. Robin continues to seesaw up for boys, gaining a little and then losing a bit. But parents seem to be rediscovering this avian name for boys. And why not? 2018 gave us a new version of Robin Hood, with Taron Edgerton firing the crossbow and answering to appealing nickname Rob. 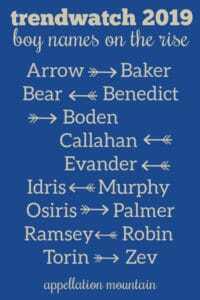 It’s a nature name in the key of River and Rowan, too. And many of us recognize that Robin belonged to the boys long before it became a 1960s favorite for girls. It’s a symbol of spring and a harbinger of good fortune, making it an appealing possibility for a son. I’ve yet to write about Robin, but check back and I’ll update when I do. Until recently, Torin was seldom heard in the US. But what a discovery! It’s got a great meaning: chief, plus that two-syllable, ends-with-n sound that continues to dominate boy names. 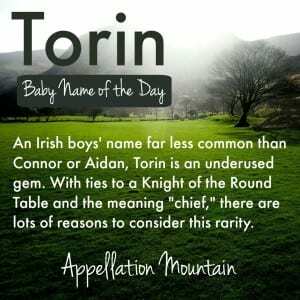 Plus, parents are forever seeking the hot new Irish name, making Torin a successor to Ryan, Aidan, and Rowan. Terrence was big in the 1970s; Tyrone peaked in the same era. But Torin feels fresh, and a handful of minor sci fi have raised Torin’s profile just almost enough. Read more about Torin here. In just three letters, Zev boasts an impressive Scrabble score, combining zippy Z and sharp V in a single syllable. Plus, it means wolf in Hebrew, and appears in the young adult sci fi series The Lunar Chronicles on a heroic character – who happens to be a (heroic, noble) twist on the Big Bad Wolf of Little Red Riding Hood fame. 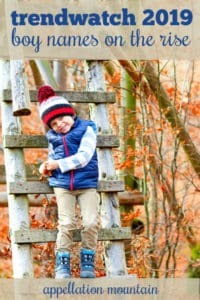 Add it up, and Zev seems like the kind of mini name lots of parents would consider – once they even knew it was a possibility. Read more about Zev here. There you have it – my predictions for the fifteen boy names most likely to enter the US Top 1000 when the new data is released in May 2019. Agree or disagree? What have I missed? I have read a lot of posts mentioning Bear, Boden, and Evander on the name sites, so those would be my top three picks!